The radio features ● Transmitter can bind to multiple receivers. ● Tiny, lightweight receiver with internal antenna. ● Multi-function programmable 3rd channel. ● Ergonomic and stylish case design. ● Steering and Throttle trim dials. RADIOLINK AT9S Transmitter. R12dsm sbus receiver. Used for my racing drone with a storage bag and simulator cable. With 3s 2200mah battery. 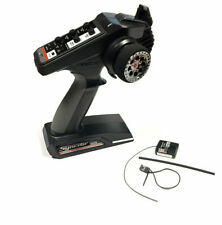 NEW Carson Reflex Stick Pro 3.1 2.4Ghz 2 Channel Stick Transmitter with Receiver, Suitable for use in most Tamiya Cars. 2- Channel transmitter unit. Short external aerial wire on receiver (approx 190mm). Ko Propo Vantage Esprit 2 transmitter and receiver, 40mhz converted to 2.4ghz. This has been converted to 2.4ghz but still has the 40mhz module, receiver and aireal. Has 2 2.4ghz receivers. I've only used one so not 100% if the second one works as well. The transmitter works as it's should, you can see from the photos the condition it's in. There's no battery leakage etc. This unit has been well looked after and comes withe the original box and instructions!!! Any questions or extra pics ask now NOT after the auction. Absima CR3P AFHDS 2.4GHz 3 Channel Radio System with LED Display (Transmitter and Receiver). AFHDS 2.4GHz System. 3 Channel transmitter. 3 Channel waterproof receiver. Built-in Failsafe receiver. Illuminated LED display. I have lost all interest in the hobby so no longer needed. 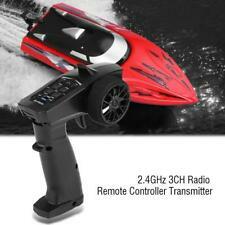 Traxxas Stampede TQ 27 MHZ AM two Channel Digital Radio System with Traxxas 2216 Micro Receiver for Car. In full working order with plenty of life for the new owner. Can be used for any RC model drone, airplane, helicopter etc. Hence its for sale. New HPI part, transmitter TF-1, receiver HPI 80569, crystals and aerial. Radiolink R8EF Receiver. Channels: 8 channels. PPM: output CH2. S-Bus: output CH1. Fit for:WPL B36 B24 B16 C24 1/16 Rc Car Kit. Receiver Board:only fit for wpl original transmitter. The rc car shown in the picture is not included. 1 x Circuit Board. Battery: 7.4V 500mAh lipo battery. Volantex Exmitter 6 Channel 2.4 GHz Digital Radio System - Superb Value! Volantex Exmitter EX6 Features The Exmitter EX6 is the perfect entry level budget radio for all car, boat or aircraft applications. Featuring a new modern ergonomic lightweight design, this 6 channel 2.4GHz transmitter is so comfortable you wont even notice you are holding it. HITEC LASER 4. FULL NI-MH & CG-84UK & MODE 2. CH70 35.100. 1 Transmitter. Channel: 3 Channels. 1 Receiver. If you do not receive our reply within 48 hours, pls. If you are satisfied with our service, pls. P/N: KTH-91803G-VT. Type: RC Accessory. Low battery warning for you. Volantex Exmitter 7 Channel 2.4 GHz Computer Radio System - Bargain! Volantex Exmitter EX7 Features With a high specification, great new ergonomic design and attractive price, the Exmitter 7 high performance radio system is a winner! This new slimline, 2.4 GHz computer radio system combines modern looks and a lightweight, comfortable design and is ideal for car, boat or aircraft use. 5 out of 5 stars - Volantex Exmitter 7 Channel 2.4 GHz Computer Radio System - Bargain! 1 product rating1 product ratings - Volantex Exmitter 7 Channel 2.4 GHz Computer Radio System - Bargain! Unboxed, Used EK-Logictrol 53.600 Mhz AM 6 Channel Transmitter with a matching 4 channel receiver in good working order from the 1960's. These have been removed for safety and transportation reasons. 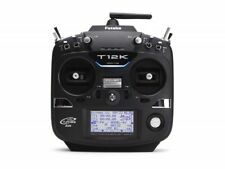 Futaba T3PRKA 3 Channel 2.4Ghz Tx FHSS & R203GF Rx Combo Set. With the legendary Futaba quality and reliability this competitively priced system is perfect for those looking to buy their first radio, or to upgrade their RTR car or boat with this more advanced set. KDS K-7Xll 2.4GHz 7 Channel Transmitter and Receiver. Delta Wing mixing supported. Throttle lock / Hold. 5 Point throttle and pitch curves. Supports both Heli and Aero usage. Conventional Aero mode. Built around frequency-agile, DSMR® 2.4GHz technology, you can use the DX5C in any type of surface application, including boats. In addition, open channels of the DX5C can be used to adjust the AVC steering and throttle systems independently. Includes hardware to add auto-centering for the left (throttle) joystick. Includes 8 channel receiver. • Futaba R3106GF receiver included. The T6L Sport from Futaba has been designed to be the perfect entry level 6 channel radio, with everything that is required included, but without the costly extras that generally are not needed with most normal models. The 6-channel FlySky FS-I6 is the perfect transmitter for sport modelers who want the power of a programmable transmitter but don't necessarily need a lot of excess features they do not use. 1 x FS-iA6 6CH Receiver. 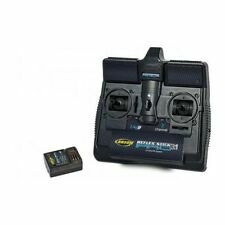 Hitec Aurora 9X Radio Set with Futaba Servos R3003-Mint Condition!! Hi, Here is my Hitec Aurora 9X radiowith RX 9 Optima and 5 Futaba R3003 servos. It is a great radio and was one i alwayswanted. Everything works on it as it should. KYOSHO INFERNO NEO 3, NEO 2, 3ch, 2.4GHz TRANSMITTER KT-231P+ & RX KR-331, RED. INFERNO NEO. 2.4GHZ FHSS RADIO AND RECEIVER. RED EDITION. DBX 2, DBX, DST, DRT, DRX. ALSO FITS THE. RMILEC T4346NB18- LRS 430-460Mhz 18ch RADIO SYSTEM(JR). Condition is Used. T4PV has many of the features most cars racers will ever need. Receiver: R304SB T-FHSS (Inc.). • Graphic LCD panel with backlighting. • Adjustable angle antenna (90°). • EPA function (All channels). • Sub trim (All channels). Collection: If you would like to collect, I am in Plymouth (close to the city center/train station) and would be happy to arrange that. THIS SET IS USED IN THE MICROCAT & TECHNICAT BAIT BOAT. Futaba 4YF Radio Transmitter for Angling Technics Bait Boats. FUTABA 4YF 4 CHANNEL TRANSMITTER & RECEIVER. Requires: 4 X AA Batteries for Transmitter. Includes 3-Channel SR310 DSMR Receiver. SR310 3-channel DSMR® receiver. The DX2E ACTIVE transmitter is built around frequency-agile, DSMR 2.4GHz technology. This exclusive Spektrum technology can be used in any type of surface application, including boats. Bashers and beginner drivers who want to upgrade to a more capable RC transmitter without spending a fortune will love the DX2E ACTIVE. 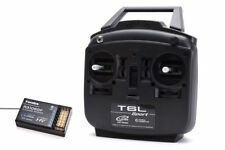 The T12KA is supplied with a full range R3008SB 8-Channel T-FHSS receiver as standard. The R3008SB has 8 channels, diversity aerials for the best signal reception, S-Bus output and HV capability. • Futaba R3008SB 2.4GHz 8 channel T-FHSS receiver included. 3 Channel R/C system. Servo Reverse. End Point Adjuster. Futaba R603FF 2.4GHz Receiver. Futaba 3GR 2.4GHZ Transmitter. The antenna is shorter and lighter, folds down for easy storage, and pivots for optimum reception. Plus, it’s compatible with the optional R603FS receiver to allow for Dual Antenna Diversity. Lightweight upgrade instantly enhances overall performance in handling and durability fit most RC car/ boat/ trucks, you will love this product. 1 FS-GT5 Transmitter. FS-BS6 Receiver. 1 FS-BS6 Receiver. 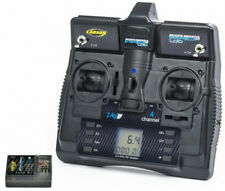 KYOSHO SYNCRO TRANSMITTER & RECEIVER KIT. R/C CARS, BUGGYS TRUCKS.